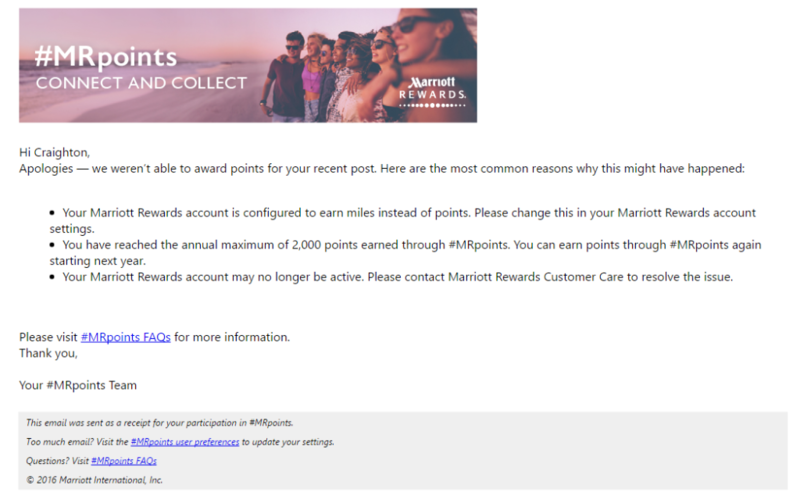 I just received a very interesting from Marriott that seems to indicate they are putting massive restrictions on their Twitter campaign that was supposed to offer around 52,000 points per year if you took advantage of the entire program. This amount of points could equal up to a night or two from Marriott if you took full advantage of the hashtag campaign. In short Marriott has been offering free Marriott points in exchange to using their hashtag and answering their questions on Twitter. This was an amazing setup and could earn people free nights at Marriott if they kept up with all the hashtags and spammed their Twitter account enough to do it. Indicating from the email that I received today from Marriott has closed off our ventures into earning more free nights at the hotel chain by imposing a 2000 point-per-year limit through their Twitter campaigns. This roughly equals to two of their Twitter campaigns which equals 1000 points-per-tweet. I’ve reached out to Marriott and Marriott Rewards about this limit to get more information but no further information is available and at the time of writing this article they have not responded to my inquiry. Have you received this email too? Was this campaign too good to be true?